Ever since I lived in New York City in my late 20’s, I was told repeatedly how much I resemble the likeness of Katie Couric as well as embodying her bubbly personality. The fact that my name used to be Katie Curran was simply the icing on the cake. We used to park in the same garage on the Upper East Side and without prompting, the garage attendants would insist we were sisters and were always trying to coordinate us running into each other. I even submitted a video to the Today Show when they hosted a contest for people who were told they reminded them of her. Sadly, no such luck in getting to meet her then. Fast forward a decade and here I am in town for 3 days for a work event. 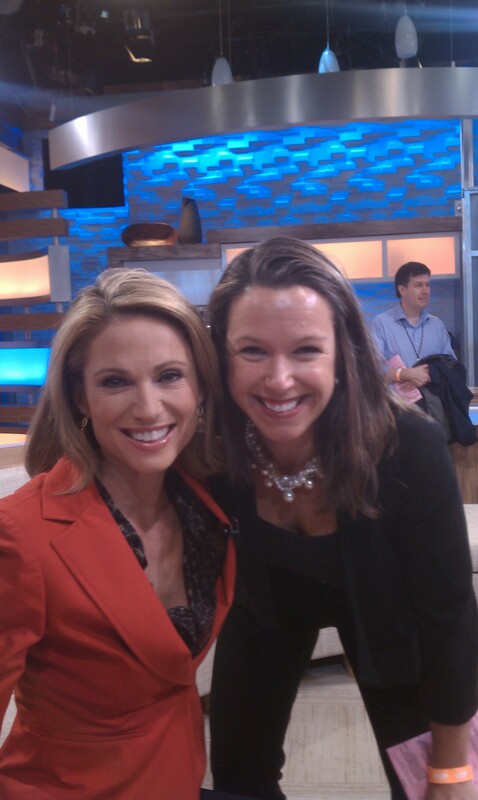 I figured why not give meeting Katie Couric one more shot while I am here. So, I went onto her new show’s website and submitted a request to see her new show. Would you believe that her assistant called me and said they’d offer me tickets for today at 3 p.m.. Of course that is right when I have to begin to run the seminar I am here to teach at Google. So, alas another chance meeting lost. In light of the fact that I am a regular contributor to a morning ABC show in Portland, I arranged to observe “Good Morning America” this morning and who unexpectedly was a drop in guest? That’s right, my alter ego Katie!!!! I literally thought my heart was going to burst out of my chest with excitement at finally being feet away from her. She did a quick 4 minute piece about Yeardley Love, the UVA Lacrosse player who was violently murdered by her estranged boyfriend in 2010. This is a story near and dear to Katie as she is a UVA Alum and is trying to bring attention to the fact that 1 out of 3 college aged girls are victims of dating violence. Admittedly, it was a bit awkward segueing to my fan worship interlude. However, I was determined not to let this chance meeting go undocumented so I was able to get this picture snapped of us before she was shuttled out with various handlers. I simply told her how much I look up to her and appreciate her work (minus having Jessica Simpson on as her debut guest last week). She was exactly they way I imagined her to be, very warm and sweet. She kept repeating how nice it was for me to so clearly googley-eyed for her. I imagine she get’s that reaction alot. As trite as it sounds, anything is possible. Who is your Katie Couric? What are you doing today to make inroads to meeting them? I was able to make this happen through my relationships and by continually asking questions. Never stop uncovering the path towards your pie in the sky. There is no such thing as a dead-end. 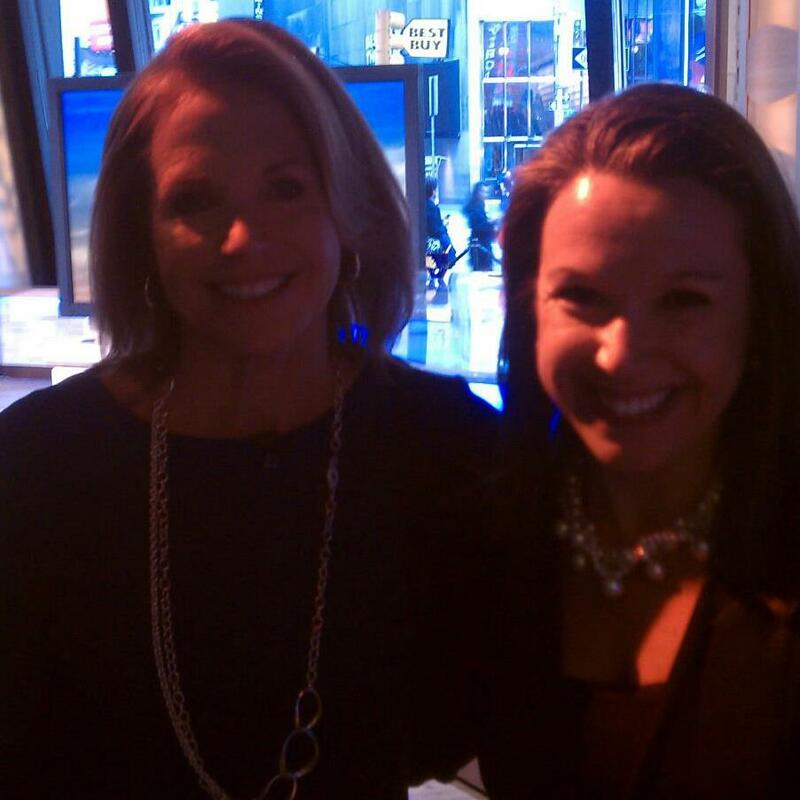 I have been trying to meet Ms. Couric for over a decade. Ironically, my chance brush with her today was totally unexpected and complete serendipity. This entry was posted on Thursday, September 20th, 2012 at 8:00 am and is filed under My Personal Initiatives, Personal Development. You can follow any responses to this entry through the RSS 2.0 feed. You can leave a response, or trackback from your own site.